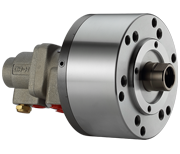 These closed center rotary cylinders allow compressed air to be fed from the rear of the distributor through a rotation unit. They can be mounted from the front of the rear of the cylinder. These air connection rotary cylinders are designed with high-quality materials, for extended life, maximum performance, and safety.